The texture and and rich vanilla flavoring of this custard is incredible. You'd never know that is is sugar free. Made heavy cream, low-carb carmel, eggs, and Stevia, it's a master piece you'll be proud to serve your dinner guests. Garnish with raspberries or strawberries for an extra treat and add a touch of red for Valentine's Day! Preheat oven to 325ºF. Arrange 6 4-ounce ramekins in a 9 by 13 pan. In a medium saucepan over medium high heat combine the cream, 1/3 cup caramel, vanilla bean and seeds, and salt. Bring mixture to a boil stirring constantly. Once mixture reaches a boil, turn off the heat and allow to cool for about 5 minutes. Meanwhile, combine egg yolks with 1/3 cup stevia erythritol sweetener. Gradually mix hot cream mixture into the old mixture while whisking vigorously to avoid cooking the yolks. Strain mixture into a pourable container and fill ramekins evenly to about 3/4 full. 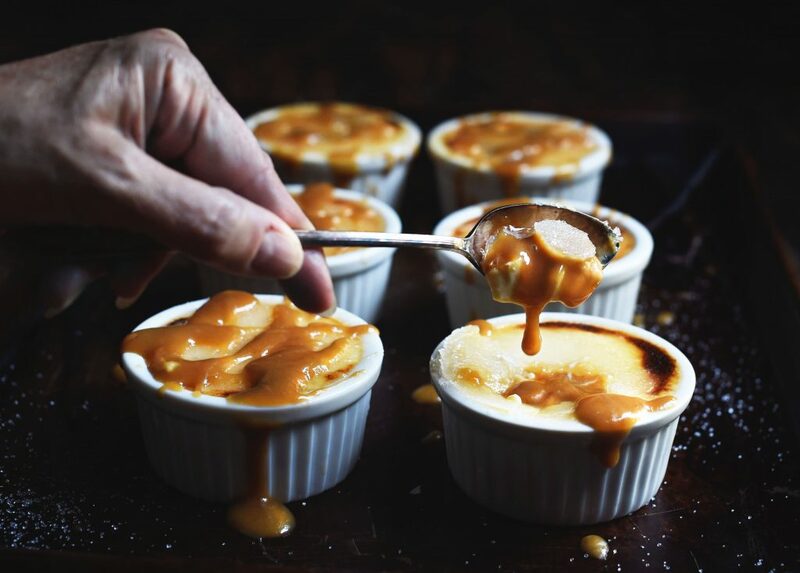 Swirl 1 teaspoon caramel sauce into each ramekin, then top them off with the remaining mixture. They should be very full. Place the pan containing the filled ramekins in oven. Carefully pour hot water into the pan to come halfway up the outside of the ramekins. Bake for about 20-30 minutes or until outer edges are set but custard still wobbles in the middle. Allow to cool on a rack for about 20 minutes before placing in refrigerator. Refrigerate uncovered until completely cool, then cover with plastic wrap. Mix 2 tablespoons stevia/erythritol mix with the brown sugar Truvia blend. Carefully and evenly spread 1 1/2 teaspoons of this mixture on top of each custard. 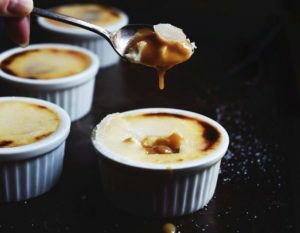 Place ramekins under the broiler and watch carefully for the sweeteners to melt and brown. Remove from broiler and place, uncovered, in refrigerator for about 10-15 minutes or until top layer is hardened. To not refrigerate too long or the top layer will start to become granular.